Many people toss and turn at night, unable to find a comfortable sleeping position. They wake up with a crick in their neck, and they have trouble focusing throughout the day. Sleeping with a subpar pillow can contribute to chronic pain. Fortunately, there are dozens of options for pillows that can help you get a good night's sleep while providing adequate support for your neck and shoulders. One of those options is the buckwheat pillow. These heavy, firm pillows date back to around 600 years ago when the Japanese discovered the health and sleep benefits of using buckwheat hulls in their bedding. The hulls do not compact, so they create air flow throughout the night, resulting in a cooler sleeping environment than the typical American polyester or feather pillows. They also provide strong support to the head and neck, resulting in better alignment and a more comfortable night's sleep. Buckwheat pillows are sacks full of buckwheat hulls, and you can usually adjust them for thickness by removing or adding hulls. (Imagine a tightly packed bean bag.) They make a soft rustling noise until the hulls are compressed. 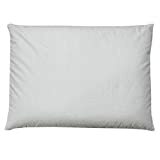 These are not the cuddly, soft pillows that many people use - in fact, they can weigh up to ten pounds, and upon the first feel, they seem hard and compact. Sound unpleasant? These pillows may take getting used to because they are so different from the polyester or feather-filled pillows most Americans use. But consumers around the world have caught on to the buckwheat pillow trend, and they're finding that it helps them sleep. Many claim that it helps relieve headaches - even migraines - as well as it alleviates back and neck pain. 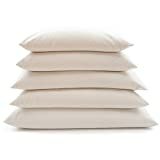 Buckwheat pillows conform to your head and shoulders, cradling your cervical spine and keeping your neck in alignment. This can open airways, decrease snoring, and reduce back and neck pain. They are extremely durable - some last up to ten years - and can be refilled once the hulls start to lose their shape. 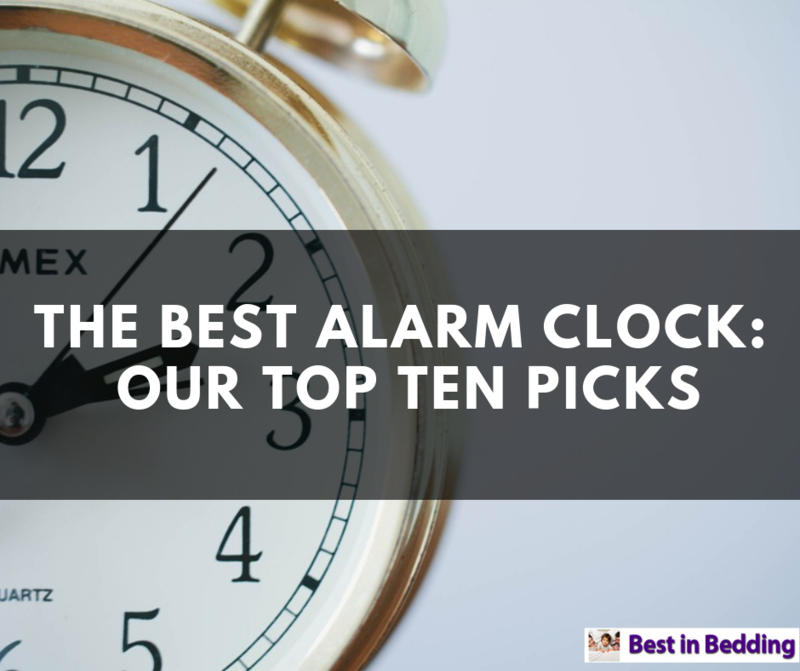 Many people claim they are best for back sleepers. Side sleepers may find that the sound is noisy and the hulls uncomfortable although there are many side sleepers who swear by their buckwheat pillows. Stomach sleepers seem to have the most trouble using these types of pillows. As with all products, there is a variety of options to choose from. Read on for reviews of the various buckwheat pillows available, and what they have to offer. Made for maximum comfort and longevity, Hullo Pillows provide an all-natural alternative to the polyester pillows found in most stores. They are made in the U.S. from U.S.-based, organically sourced buckwheat husks and 100% cotton twill casing. Hulltex, the Minnesota-based maker of Hullo pillows, is dedicated to responsible business practices and donates a percentage of each purchase to The Nature Conservancy. 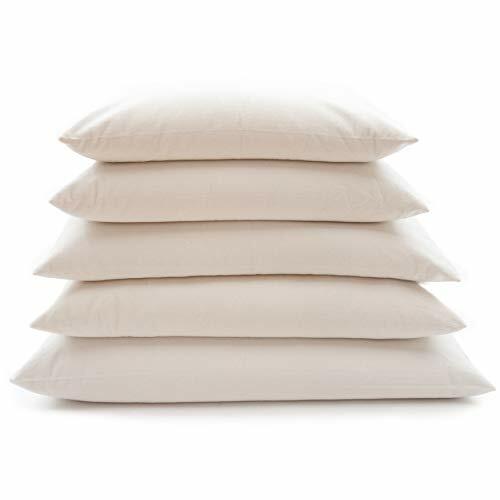 Hullo pillows have a comfortable mix of firm and give, so if you are transitioning from regular polyester pillows to buckwheat, this might be a good choice for you. Itc comes in three sizes - small (20 x 14 inches), standard (20 x 26 inches), and king (20 x 26 inches). Hullos come with a money-back, 60-day warranty. We picked some similar products available on the market to see how they compare. The firmness may take some getting used to. This may also make the pillow uncomfortable for side and stomach sleepers. However, this is true about all buckwheat pillows, not just Hullo. As with all buckwheat pillows, the ComfySleep pillow must be disassembled to wash. The pillow case can go in a washing machine with your regular laundry. The hulls must be laid out to dry if they come in contact with water because you don't want any moisture trapped in your pillow. That can degrade the hulls, or cause mildew to grow. Do not put any buckwheat pillow in the washing machine. The ComftSleep's packaging contains a nice personal touch, because when you buy from them, you are supporting a family-owned business that keeps all its manufacuring in the U.S. Its website even shows a map of where all the parts of its pillows come from: the cotton is grown in Texas and the buckwheat in North Dakota. The fibers are woven in California and sewn into pillows in New York. The ComfySleep pillow comes in four sizes: traditional (14" x 21" x 3.5" ), classic (14" x 23" x 3.5"), classic plus (14" x 26" x 4.5"), standard (20" x 26" x 4.5"), and queen (20" x 30" x 4.5"). ComfySleep buckwheat pillows can be found on the manufacturer's home page, ComfyComfy, or on Amazon. ComfySleep pillows do not come with a warranty. Check with the manufacturer for an update to this policy. Extreme firmness may make this pillow prohibitive for side and stomach sleepers. The cheapest of the four options, Sobakawa pillows do not offer the same U.S.-made, organic practices as Hullo and ComfySleep. They are also lighter, around 1 pound. If you order on Amazon, this pillow comes with a free pillowcase. This pillow is the smallest and thinnest of the four we reviewed, with a height of about 2-3 inches. Unfortunately, it is not adjustable - that is, you cannot put more hulls inside it. Its maximum height is only about two or three inches, which actually causes neck or back pain for some. The Sobakawa comes in two sizes: 15" by 20" and 20" by 29". "Soba" means "buckwheat" in Japanese, and this company claims that its pillows are as close to the traditional buckwheat pillows as you can get. However, some reviewers and product details list the filling of Sobakawa "buckwheat" pillows are polyester. While it has gotten many positive reviews, it has also received many negative reviews. If you are looking for a Sobakawa buckwheat pillow, do not be confused by the company's similar product, which is a "cloud pillow" filled with air beads. That is not a buckwheat pillow. Look for the "Natures Pillow" logo. Small size may make it more comfortable for stomach sleepers. It can also be used as lumbar support in the car. Thinner than the other pillows, the Sobakawa's height is about 2-3 inches. This pillow is imported, not made in the U.S. with U.S.-sourced parts. Beans72 pillows are advertised as having "Rolls Royce quality," and many consumers and reviewers support that. Its buckwheat hulls are triple-air-cleaned - a thorough, organic process that eliminates dust, flour, and other superfluous materials, resulting in a 100% natural, hypoallergenic product. 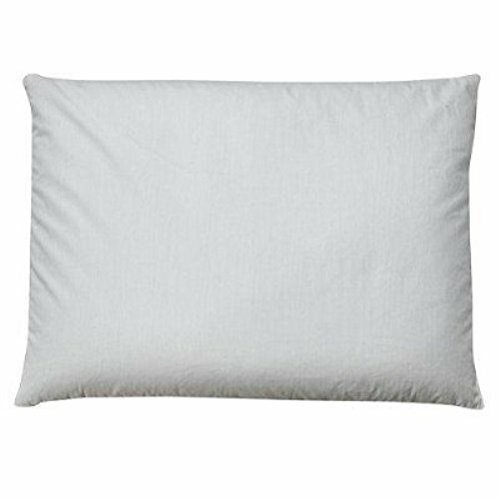 The cotton casing is unbleached, so this pillow is truly without chemicals, making it the best choice for sensitive, allergy-ridden sleepers. This pillow also comes in many sizes, from travel to king and up to two body-pillow-sized versions. The larges body pillow, which is about $115, is 20" by 54" and weighs 20-24 pounds. 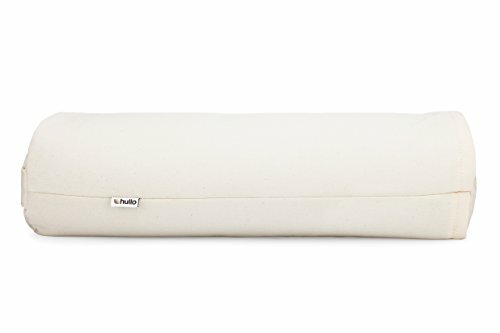 The smallest, an 11" by 16" travel-size pillow, weighs only 2-3 pounds and costs about $35. If you order a Beans72 pillow, it comes in a unique hemp-like bag, adding a personal touch to your delivery. The Beans72 pillow is heavier than other buckwheat pillows of its size. The noise and firmness may bother some people, especially side and stomach sleepers. The hulls may bother your ears if you are a side sleeper. Most buckwheat pillows have these things in common: they have a cooling effect due to their air flow. They are firm and heavy and distinctly unlike most polyester pillows. They are durable and will last much longer than your average polyester pillow. They provide excellent support to the cervical spine, which can cause better sleep, relief from headaches (including migraines), reduced snoring, and more energy throughout the day. 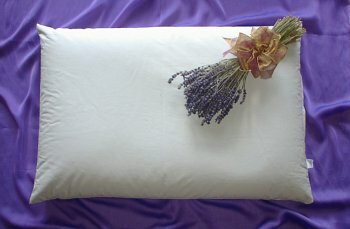 Many people with chronic neck pain or sleep trouble have found relief through all the above-reviewed pillows. The Sobakawa pillow clearly comes in fourth. It is the least expensive, but that is apparent in its performance. It is not adjustable, and it does not allow for any addition or removal or buckwheat hulls. It is a thin pillow that cannot be made thicker. However, some distributors advertise that it has a lifetime guarantee, so if you do find that you love the Sobakawa pillow, you are set for life. When it comes to choosing the best, we have a hard time choosing between the Beans72 and the Hullo. Both are similar in their level of comfort (once you get used to the firmness, that is! ), ethical sourcing, and cooling effect. Beans72 offers the widest variety of sizes, and it provides the most hulls, giving you the maximum choice for the pillow's fullness. The ComfySleep pillow comes in a very close second. The biggest drawback to the ComfySleep is not the quality or comfort, but in the fact that it has no warranty. Since switching to buckwheat pillows can be a big change, we liked the security of knowing there was an option to return the pillows. Buckwheat pillows just might be the new wave of sleep comfort - for those willing to get used to the firmness, the sound, and the weight. If you are considering making the switch, there are many excellent options available to you, starting with the Beans72, the Hullo, and the ComfySleep.